Welcome to JK Media. 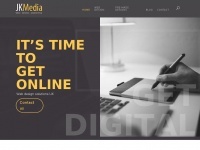 JK Media is an online marketing company based near Cromer on the North Norfolk Coast serving businesses in Norfolk and nationwide. We offer pre-made websites for start-ups and entrepreneurs on a budget, bespoke web design, digital marketing and SEO. 1 review has been written for Jk-media.co.uk yet. James did an excellent job of our website BIGDaddyPR. Thanks again James for all your help.